A Ye and Drizzy project could be on the way soon. 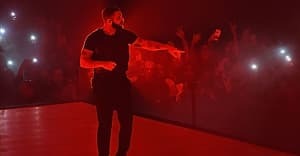 On the final night of Drake's OVO Fest in Toronto, Kanye West appeared as the fourth, and final, surprise guest of the night, performing "Pop Style" with Drake and solo hits, including "Father Stretch My Hands" and "Runaway." Kanye also made a special announcement: during a pause between songs, Ye asked the audience, "is y'all ready for this album?" Kanye had previously hinted at a collaborative album with Drake during an interview on The Breakfast Club in February 2015. Around the same time, Kanye tweeted that he had new music with Drake and Future that was "gonna drop soon." Watch more clips of Kanye West's performance at OVO Fest below.